Albert Henry Vaughan, joined the Worcestershire Regiment at Birmingham on 12th January 1901, possibly hoping to go to South Africa, but certainly following a family tradition. He was the son of Mr and Mrs John Vaughan of Fern Villa, North Malvern and was to serve with the regiment for 15 years, his brother Charles was also a regular soldier, who served with the 1st Middlesex Regiment as a sergeant in the First World War. 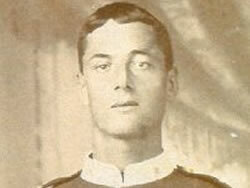 He was promoted to Cpl on 15th March 1906 and served in Malta with the 4th Battalion. In 1912, when serving with the 3rd Battalion based at Tidworth Albert Vaughan, then a Lance Sergeant re-engaged, agreeing to serve up to 21 years with the Colours. At the outbreak of war, having risen to the rank of sergeant, Vaughan was in Meiktila, Burma with the 4th Battalion. While the majority of the regular army went to France straight away, the regular battalions on overseas tours took their time to make it back to Europe. Vaughan’s battalion landed at Avonmouth in February 1915 and was one of those that formed the 29th Division, which despite it’s high number was made up solely of regular units. Rather than France, the ‘Incomparable 29th’ as it later became known was destined to land at Gallipoli. On the 21st March a ‘whole army of relations from Birmingham’ (probably including some members of the Vaughan family) joined the local population in Leamington to bid the 4th Worcesters farewell. The battalion embarked at Avonmouth for Alexandria, and after refuelling at Malta, landed at Alexandria on 4th April, Easter Sunday. The battalion sailed for Lemnos on the 13th, and it was obvious to all ranks that they were to land on the Gallipoli Peninsula. It was only on the 21st that definite orders were received. The regimental history states: “The orders for the 29th Division were to effect a landing on the end of the Peninsula, in the neighbourhood of Cape Helles. The objective of the Division was a line across the Peninsula, including the height of Achi Baba, some five miles from the Cape. Albert Vaughan was killed on the 25th, the first day the Gallipoli campaign for the 4th Worcesters, but without knowing in which company he served it is very difficult to say how he died. W Company made the first advance, leaving their minesweeper at 8.30am. The leading platoon along with the Brigade staff suffered heavily casualties on V Beach and it was decided to land the rest of the company at W Beach. The remainder of the battalion also landed at W Beach, and ‘Z’ and ‘Y’ Companies advanced towards the Turkish redoubt on the high ground, with ‘X’ in support, and the remainder of ‘W’ in reserve – the leading companies came under heavy fire. The leading men encountered thick wire entanglements and volunteers had to laboriously cut through them, before the advance could continue. At 2pm, after many of these wire cutters had been killed or wounded, two channels were cut. The Worcesters and Essex men rushed the redoubt and pressed on, but were held up by more wire and another redoubt, three hundred yards in front. ‘X’ Company came up from support to cut the wire and attack the position. With not inconsiderable losses, this second mammoth task was completed at around 4pm. Fortunately no counter attack was made, and the 4th Worcesters reorganised and counted the casualties, which included around 100 killed. By the end of the war the Commonwealth War Graves Commission recorded Albert Vaughan’s next of kin as his brother, William John Vaughan of 5 Prospect Terrace, West Malvern.